The chart setup for gold and silver does not really look like prices are ready to move (much) higher, at least not in the short run. Excellent gold and silver chart analysis was provided by Michael Noonan in Gold and Silver Charts Going Into 2015: Expect More of the Same, courtesy of ChartAnalyst.expert. Another excellent piece was written by the editor of MarketOracle Gold Price Trend Forecast 2015. Although we should not expect fireworks in the prices of the metals, there are some favorable trends playing out “under the hood”. They do not reflect the generally accepted pessimism towards the metals. Our belief is that it will take some time until the price will move back in line with these fundamental trends. Until then, gold or silver owners can rest assured that the gold and silver market is not as bad as some would like to make you believe. 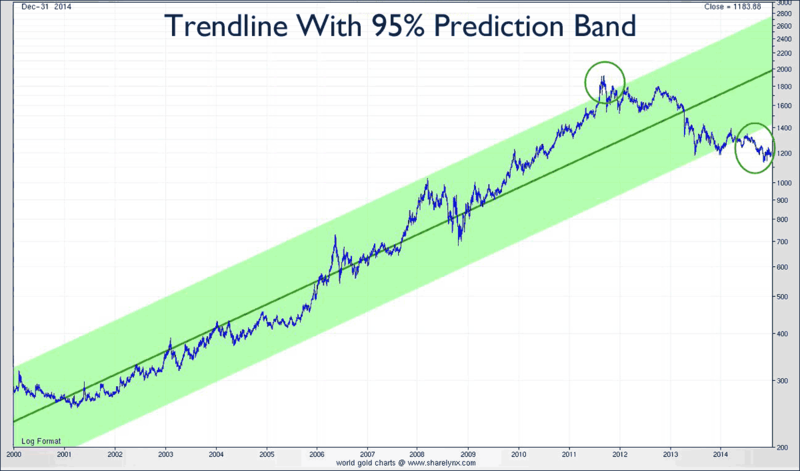 The first chart below shows the major bull market trendline for gold. In 2011, there was a break above the trendline for a couple of months, as indicated with the green circle. Around April / May 2014, gold broke below the trendline, and it is still trading outside the trending channel. A key takeaway from the chart is that the 2011 peak was extended. Although hard to tell based on this chart alone, it could be that the ongoing correction is a similar “extended” reaction within the trending channel. There is always a possibility for the secular bull market to be over (nobody knows at this point), but the fundamental situation does not call for an end of the bull market (see also this fundamental analysis Gold Outlook for 2015). When it comes to silver, the picture looks rather similar to the one in gold. One difference, however, is that the silver peak of 2011 was much “sharper” than the one in gold. Similarly, the ongoing correction currently seems to be “sharper” than the one in gold. Also, silver broke outside the trending channel a bit later than gold, i.e. around July of this year. That was not coincidentally the month in which the U.S. Dollar started a huge rally. These charts could suggest that the ongoing correction could be “balancing off” the extended rise of 2011. However, there is not too much time left for the price of the metals to reverse their course. 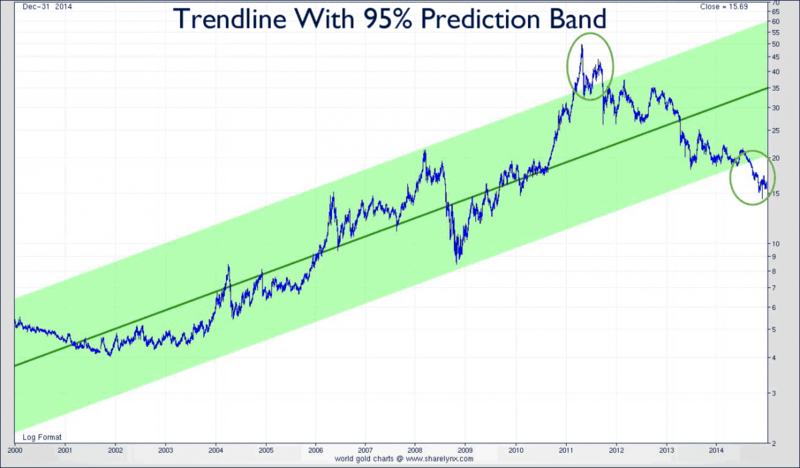 If the precious metals do not reverse their trend somewhere in 2015, then the long term trendline has been invalidated. So far, the “damage” is still “repairable”. One of the key indicators of investment demand for gold, is the amount of physical metal held by ETF’s. The two charts below show the combined physical holdings behind all major ETF’s in the West. Think of very large ETF’s like the GLD and SLV, but also smaller investment vehicles like GoldMoney or Sprott Physical Gold Trust (PHYS). Mind that the physical holdings in the COMEX are included in the figures. In gold, there was an outflow in 2013 of some 30% while another 8% left the ETF’s in 2014. The amount of gold ounces are at the lowest point since 2009. That is clearly not a sign of strength. On the other hand, in silver there was a small increase in 2013 and a similar rise in 2014. The amounts are surely not spectacular. The point is that, given the weak price behavior of both metals, silver’s physical ETF holdings have held up very well. Another important data point in the physical market is the gold and silver coin demand at the U.S. Mint. 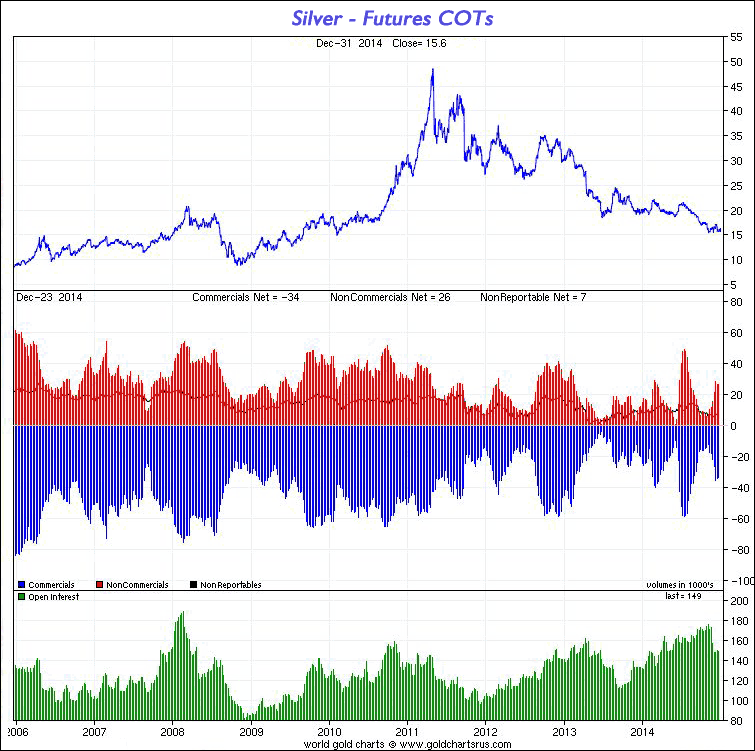 Here again, similar to the previous trend, the data are confirming silver’s relative strength in the physical market. Below are the year-on-year sales figures for U.S. Eagles since 2008. Courtesy: usmint.gov. The divergence in these figures is clear. 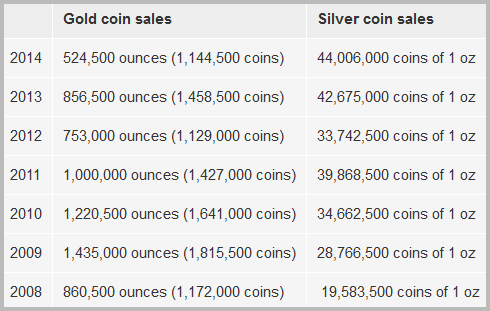 Silver sales have reached an all-time high, while gold sales have declined, especially in 2014. U.S. investors are used to look at the price of gold in U.S. Dollars. At least as important is the price (and its behavior) in other currencies. 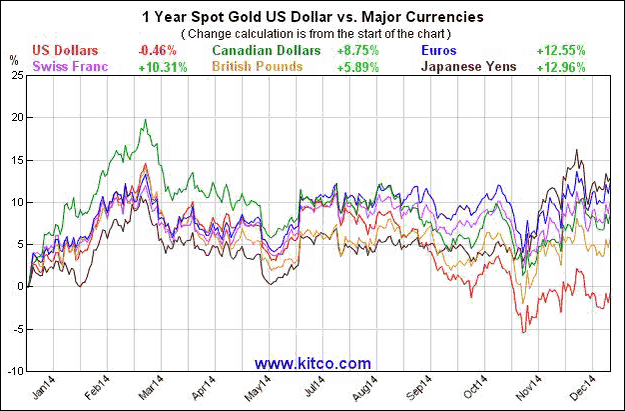 Gold has gone higher in all major currencies in 2014, from 6% to 13%. The only exception is gold in U.S. Dollars. In other words, gold has held its value in 2014 in all but one major currencies. The slight loss of Dollar gold in 2014 (0.8% year-on-year) was largely offset by gains in all other currencies. That is certainly not the type of message you will hear in the mainstream media. Another way to look at the same data is to compare the value of major currencies with gold. That is what the next chart shows (courtesy: usfunds.com). Mind that Dollar gold is used for the comparison in the chart. Also, mind that the value of the U.S. Dollar is not on the chart as it was the obvious (and only) winner among the major currencies in 2014. The positions of large traders in the COMEX gold and silver market is neutral. One could rightfully ask why we have taken up this fact in our list of “remarkable trends.” We believe we could make a point that a “neutral” (read: not extreme) position will avoid a significant price swing lower. In other words, it somehow “offsets” the pessimism towards the idea that the metals can plunge any time in the same way they did in the spring of 2013. At this point, the ongoing extreme pessimism towards precious metals investing is not reflected in the futures positions. So we consider it a positive from a relative point of view. The chart below shows the current positions of commercials and non-commercial traders with the blue and red bars (middle of the chart). Those are the key participants in COMEX, and they are nowhere near extreme readings. It also shows that the pace of change of their positions relative to the pace of change of the price (indicated with the green and red rectangles) is currently neutral. There is plenty of speculation that the U.S. is not holding the amount of gold they are pretending. If that would be true, it would manifest at some point in the future. With a number of significant withdrawals in 2014 from the NY Fed vaults, the last one being 47.1 tons, the Fed’s total earmarked gold currently stands at just 6,029 tonnes. According to Zerohedge, “November marked the biggest single monthly outflow going back to the turn of the century. This is also the lowest amount of gold held at the NY Fed vault located at 33 Liberty street in the 21st century.” The trend is clearly down, a readjustment of the price could follow at some point in the future when trend 7 (see below) would amplify. Belgium’s governor of the central bank is looking at how they can bring their gold reserves back into the country. Now combine this trend with the previous one (gold held at the NY Fed down). 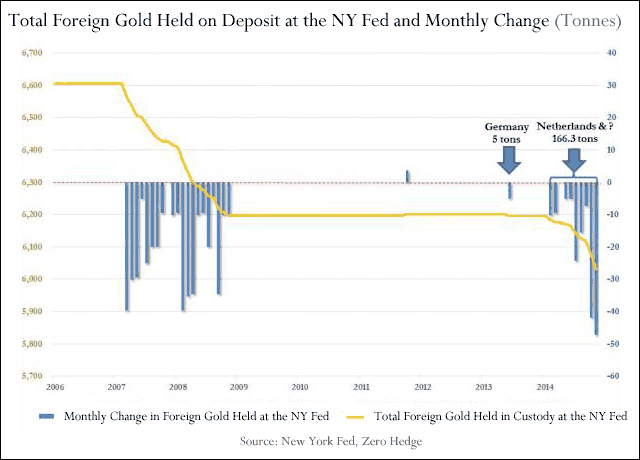 Try to imagine what happens in the following two scenarios: scenario 1 in which the amount of gold held by the U.S. is truly the amount it is communicating versus scenario 2 in which the U.S. is not holding the gold it pretends because it is rehypothecated over the decades. Time will tell, but we are getting very close to the point where the truth could become clear. 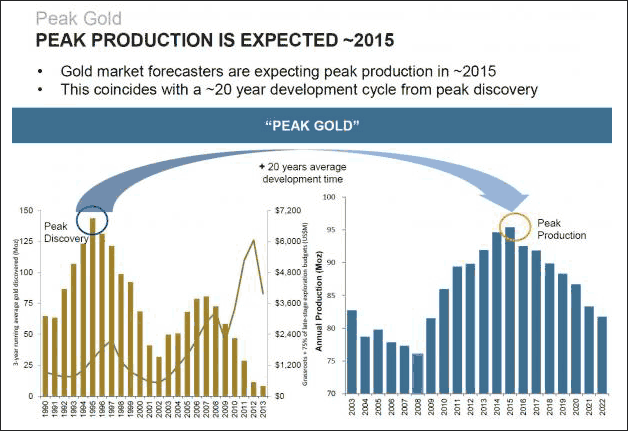 Gold production is expected to peak in 2015. As the next chart suggests, the discovery cycle peaked some 20 years ago, and that will only reflect as of this year in the production volumes. Combine this with the falling gold prices (currently right below the average cost of production), and the result is a series of liquidations of miners and mining projects which would lead to an even more drastic short-term decrease of gold output. Only two years ago, India was the number one gold consumer in the world. With a series of gold import restrictions, and with a sudden rise in China’s demand for gold, China took over the position of the biggest gold consumer. Since the second half of this year, it seems that India is back on track, while China is not showing any sign of slowing down their appetite for gold. Estimates by several analysts show that China’s gold imports are heading for an annual total of close to 2,100 tonnes. In India, after the slump of 2013 and the first half of 2014, the estimates of analysts show that Indian gold imports in 2014 could be close to 1,000 tonnes (if smuggled gold is taken into account). Mind that the sum of gold demand by both countries is surpassing by some 40% the annual production. In other words, China and India alone are consuming all newly mined gold plus are taking some 800 tonnes per year off the Western market. Now here is the point: combine this with the previous trends (in particular 6, 7 and 8), and try to understand what happens if this situation continues. And here is an additional trend, which is not directly related to the gold market, but rather indirectly. As of the last day of 2014, total US debt soared by $98 billion in one day, and closing off 2014 with a new all time high total of $18.141 trillion in Federal debt – an increase of $136 billion in the month of December and $790 billion for all of 2014. 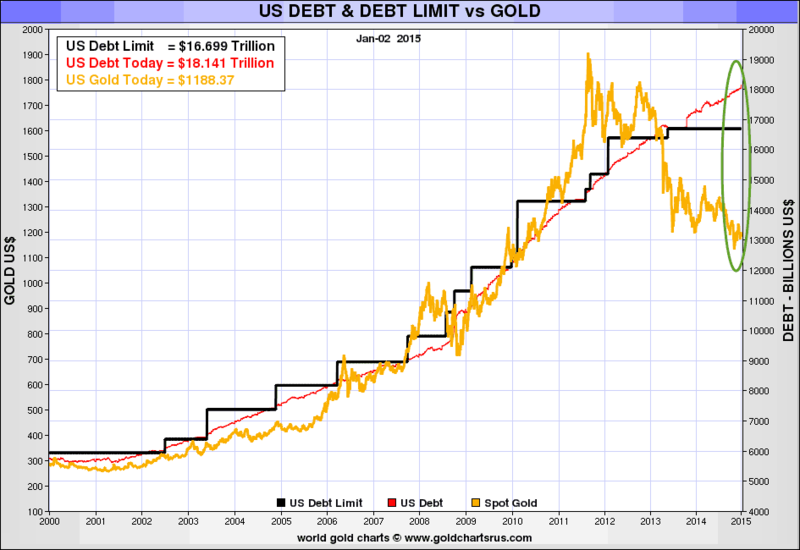 The last chart visualizes the gigantic gap between the gold price and the debt level. At some point, something has to give. Several charts are courtesy of Nick Laird’s fantastic service: Sharelynx.com. How Much Further Can Gold Fall?